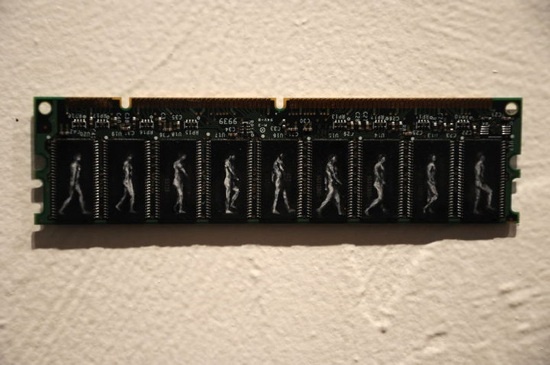 Microchip Paintings « Adafruit Industries – Makers, hackers, artists, designers and engineers! “Smaller and Faster” has replaced “Bigger and Better” as the leading catchphrase of commodities. I reflect this with my miniature paintings on microchips. From wild plants and animals to human tools and portraits, the range of subjects is diverse. I seek poetic images which raise questions and strike metaphorical chords when painted on microchips -the building blocks of the digital age. This is an also homage to classical miniature paintings. Paint is usually oil applied with tiny brushes -some of which I craft by hand using my own eyelashes. The size of these works is usually a square inch or less, so magnifying glasses are supplied at gallery showings.